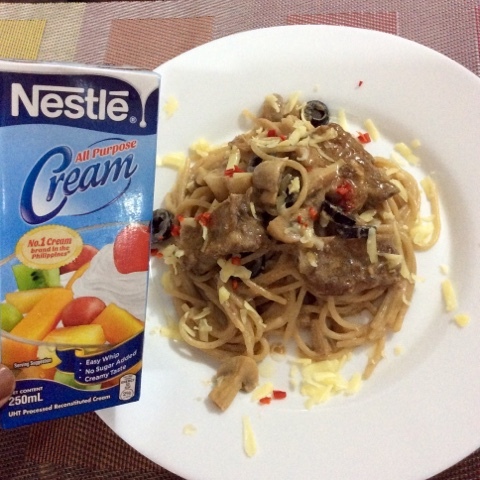 This was my entry for the Adobo dish with Nestle Cream over at Nestle Cream Facebook page. But this entry did not make it to the cut off time, imagine the frustration and disappointment? Though it did not make it I am happy to share it to you guys. Adobo has become one of the signature dishes of Filipino in every kitchen cooking. You can have this dish any time in any season. Every Filipino family here and abroad are accustomed to having Adobo in their table for lunch or dinner. You can use up any meat for an Adobo dish but the most commonly use is pork next would me the chicken or sometimes you can mix the two. Having soy sauce and vinegar as a combination in a dish, the dish will not spoil easily specially when it is cooked properly and simmered for hours. A little story during College days, when I come home for a weekend to do laundry and get my school allowance, my Mama prepares a container full of Chicken Pork Adobo that I can bring with me and I can have it for several days and even share it with my board mates. It became my comfort food from home away from home. I don't know why Adobo dish can bring you back through time when the kitchen smells so delish because the casserole of Adobo is simmering down for hours until the oil and the soy sauce separates. Adobo dish it is so easy to do...believe me! Nowadays Adobo dish is being whipped up and added to another dish making it more versatile and being known all over the world. Here is my simple Adobo pasta dish you can try. Boil pork spareribs in soy sauce, vinegar, bay leaf and pinch of sugar in 1/2 liters of water (optional pork brought), until tender. In a low heat pan add olive oil and minced garlic sautee until golden brown, add the tender pork ribs to the ban and fry a little by mixing it with the oil and garlic. Add the soy sauce, vinegar from the simmer and reduce it by simmering slow. Sautee onion with oil in a pan, add mushrooms and Nestle cream bringing to boil in a low heat. Add the boiled pasta combining all the cream in the pan. Add slices of black olives. Set the pasta in a plate, topped it with the Pork Adobo spare ribs slices with cheese and chili flakes to add some kick with the flavor of the cream. The dish can serve 2-3 person and you can have some Pork Adobo left for steamed white rice pairing. It would be the awesome if this dish made it but I'm glad it was a success when I paired pasta and Adobo together. Did you like this dish? Hit me up in the comment section below.